A friend of mine likes to glue together picture frame corners to make very tiny frames for very tiny pictures. I have a couple for my bathroom but wanted to make some more. 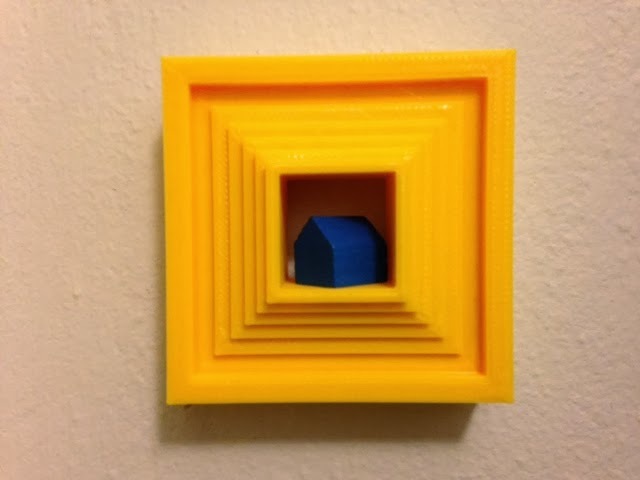 Here's one with a 20mm-sided cube area in the center for displaying a very small model or object (in this case a Settlers of Catan settlement piece). Settings: MakerWare "standard" with no raft or supports, in 1 hour and 26 minutes. Technical notes: I put a nail recess in the back but the frame and its contents are so light that it holds up very easily with blue poster gum, no nails required.